“Out of Home” is quickly becoming a tired advertising channel. Digital + OOH does not necessarily fill that need. Not at all. Relevance & timely + “right there” (at that moment in time) fills the need. This is what the new OOH can be. Unfortunately, though, as a channel, OOH is only a check-the-box thing. We must change this. “Digital” can help. But it’s much, much more. This entry was posted in Digital Signage, Emerging Technology and tagged DOOH, Engagement, OOH on 08/11/2012 by Mike Cearley. I think this is a great formula. The holy grail, in fact. This is where I see the real potential in truly using the places and things around us to engage. Not just through one, but all three. Here’s the thing – the problem right now is not whether or not the technology can do it. The real problem is cost and complexity. This is what prohibits scale. But you can even see how compelling something like this could be out in the real world, and then the reach it could potentially have in the virtual world. It’s a combination that could really spark engagement beyond an “experiential” level – something that we could see as a normal part of our everyday lives as we go about the real world around us. Here’s the other thing, which to me, is more interesting. The tie-in between virtual basketball – regardless of how novel it is and how integrated the experience is – and ING is completely lost on me. They indicate that they wanted to “demonstrate how easy and efficient banking can be” with ING, but how that idea manifests itself through a virtual free throw is beyond me. I get that they wanted to reach a younger demo, but even still, is this demo going to remember ING is the one that brought this experience to them? It just seems too disconnected. So, something like will get attention for sure. Right now, only a relative few might use it. I suspect it’s only a matter of time before more “non-technologically-curious” people would interact with something like this. But, the bigger concern should be to remain on brand. This, along with great technological integration like this, will be the true holy grail. This entry was posted in Emerging Technology, Marketing, Mobile and tagged DOOH, emerging technology, Mobile, Social on 05/10/2012 by Mike Cearley. This entry was posted in Emerging Technology and tagged connected consumer, DOOH, IOOH on 03/23/2012 by Mike Cearley. Last week, I read an intriguing article by Garrick Schmitt of Razorfish, titled How Demand for Physical Experiences is Transforming our Physical Spaces. In it, he points out how the entire physical world around us is becoming a screen and that consumers’ expectations have reached a point to where that physical world should be turned on in some form or fashion. This is a viewpoint that I have mostly gotten behind many times on this blog. I say mostly because of those consumer expectations. I’m not sure that, even now, in August 2011, consumers expect the physical spaces around them to be turned on, and even more, transformed into interactive experiences. I don’t know that average consumer capacity is ready for that. What do you think? Guess when that article was written? 2 years ago, in September 2009. Awesome. In my opinion, Schmitt has always been on the forefront of these technology-led experiences in the real world around us. This is case-in-point. I remember back during that time, it was around the time that I was leading the software development at imc2, for our interactive Out-of-Home solution. I always admired how Schmitt recognized the potential – and future demand – for these types of experiences. Time is a funny thing, especially in regards to technology adoption. At the end of the day, that’s what we’re talking about here. Consumer demand is directly tied to their comfort level with any particular technology. We’re just now seeing smartphone use creep their way up to the majority. Smartphones have been around for years. But just now, after all these years, the average consumer is not intimidated by them. They know how to work them and, even more, know how they can make their lives better. It also helps that everyone can now afford them. Kinect is another great example. I wonder how comfortable people would have been with the idea of gesture control, at such an immersive level, two years ago? 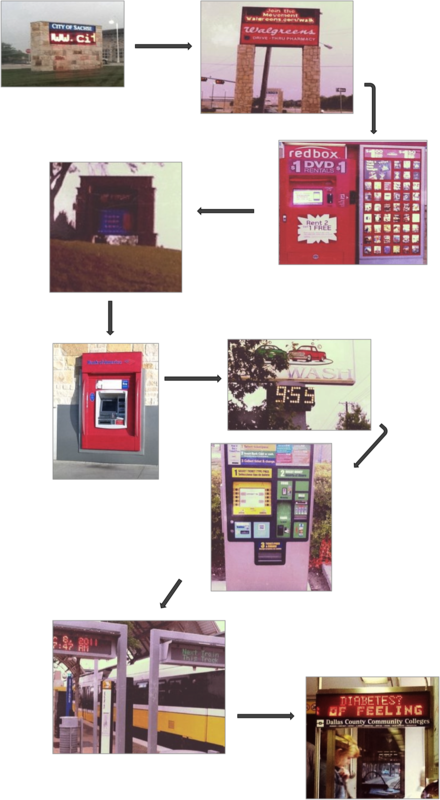 In the article, Schmitt points to “Out-of-Home” examples that are driven by enabling technologies (mobile and RFID) and people themselves (social media). I think it’s easy to think about touchscreen-this-and-that when you think about the world around us being turned on. But, as shown in the Schmitt article, and in some of the more recent engaging examples, actual public touchscreens are not part of these experiences. The place or the thing is the canvas and the interactivity is controlled outside of it, either through mobile phones or computers. The effective thing with all of these examples – and the thing that I think we can all learn from – is that consumers want it all, in the most convenient way. What I mean is, consumers want information and connections and whatever else they deem valuable. And they’re always going to be driven by what they’re comfortable with because it’s usually the easiest. They’re used to being on computers, connecting with other people through their social networks. They’re used to navigating to whatever they want on their mobile phones. Are they used to walking up to a touchscreen and interacting with it? Also last week (the same day I read the Schmitt article), I saw that Cinemax deployed an immersive touchscreen experience in the heart of New York City. As you can see, the experience spans the front of an entire NYC building. It’s obviously noticeable. Consumers are enticed by it. And, by the looks of this video, comfortable enough to go up and play with it. Having lived and worked in NYC, to get anyone to stop and interact with a storefront, is a feat in and of itself. Yes, people can also interact with this experience through their mobile phone. But this is largely a public-facing, touchscreen experience. And it doesn’t seem like anyone in the video is a) intimidated or b) unaware of how to use it. Is this indicative of Anytown USA? But the question is, despite their simplicity, why am I the only one who I ever see scan them? Simplicity and comfort are not the only two linchpins to this demand that we all know is coming. You can bring up the Minority Report analogies all you want, but this is not a far-fetched representation of our future world. Glorified, perhaps. But not unrealistic. Two years ago, all of these interactive Out-of-Home activations were novel enough to garner attention. Are we still in that novel stage? Value. That’s really the question, right? In this constantly-on physical world, what’s going to be noise and what’s going to be valuable? By virtue, demand always creates noise. 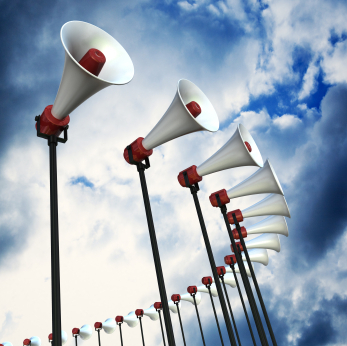 Are consumers ready for all that noise? This entry was posted in Emerging Technology, Marketing and tagged Digital Out of Home, DOOH, Interactive Out of Home, IOOH, Kinect, Mobile, offline to online, QR Codes on 08/15/2011 by Mike Cearley. All we’ve been buzzing about around here, in my world, is Google+. I’m not going to get into all of the opportunities or redundancies that it might or might not bring to the table, but I will say this – here’s what it shows us – even Google, who seemingly has been left behind in the social space by Facebook is constantly innovating. This is not just another Facebook. It is fundamentally different. When looking at the DOOH industry, I think we can all agree that there has been its own fair share of innovating, especially in the recent past, as seen here, here, and here. The experiences that occur outside of the home, through technology, is fundamentally different than it was even a year ago. 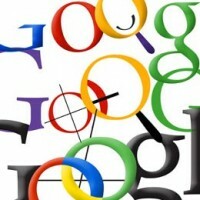 And with new innovations, just as Google shows us, it’s going to look different sometime in the (near) future. Here’s my question – since the technology fundamentally changes the game, are the DOOH industry and its players poised to keep up? This entry was posted in Digital Signage, Emerging Technology, Marketing and tagged Digital Signage, DOOH, Google, innovation on 07/13/2011 by Mike Cearley. What a past couple of weeks it’s been for the digital signage industry. I don’t even know if I’m referring to the industry correctly anymore, given one of the key figureheads recently proposed renaming the term “digital signage” completely. Truth be told, I’ve never been clear on what to call this industry and even whether or not to call it an industry, much less what the industry is defined around. But in the end, I come back to the same thing – it’s the digital signage industry. Because it’s centered around digital signs – er, signs that are digital – and the industry is larger than a group and busineses are made around the components to run digital signs. So, it makes sense and it’s easy. I say “digital signage” (with or without industry) and everyone I talk to understands what it is, at least on a basic level. Semantics. The true waves – those that could have a real impact on changing the face of digital signage, far beyond words – are being made by the people running business in this industry. Three major players, rVue, RiseVision, and Screenreach, have all recently hired individuals who live and breathe engagement. Not digital signage. Engagement. These are individuals who will benefit the industry because they have specific digital signage experience, too, but they are not about the sign. They’re about the engagement. That is an important distinction, especially for an industry that ironically seems to behind the technology-enabling-engagement curve. These individuals are awesome for the industry. I think it’s interesting and admirable that each one of these companies created positions for these individuals. These were not positions that have existed before. They were made for these individuals. Before I get into that, let me just tell you a little bit about these individuals. I have the pleasure of personally knowing each of them and I’m better for it. First up is Jennifer Bolt, who, for years, has been the head honcho for the media department at Tracy Locke. She has immense media planning and buying experience and knows more about the media side of digital signage than anyone I’ve met from an agency. She just joined rVue as Chief Strategy Officer. She knows, firsthand, the challenges that agencies face when guiding major brands through allocating and buying Digital Out-of-Home (DOOH) (a la digital signage). She knows how to ask the right questions of brands to understand where advertising dollars can be pulled from. It is complicated – from a brand perspective and agency perspective – and as a result, the digital signage industry suffers. Jennifer is a wonderful addition to the industry because she knows how to talk to agencies and exactly where to go within them to be a guide and help provide clarity all around. Next is Paul Flanigan who recently joined RiseVision as VP, Marketing & Business Development. Paul is one of my first and best friends in the industry. He comes with a wealth of experience in branding, marketing, and communications and is just an overall bright and seasoned guy. He worked with the guys at The Preset Group and before that he ran Best Buy’s in-store network. Paul is an engagement guy. He gets the power of digital signs and how if they don’t create engagement, they’re not realizing their full potential. Now, by working with a digital signage software provider, he will not only be able to shape the actual product, but he’ll also be able to speak to prospects about the true potential of reaching and connecting people when they’re outside of their homes. Which leads me to my boy, David Weinfeld, who, too, was with Preset before going on to Obscura Digital and just last week was named Chief Strategy Officer of Screenreach. The first thing you see when looking at the Screenreach website is, “Turn any screen into a 2-way interactive experience.” This is a perfect fit for Dave – a place where social, mobile and digital signage collide. He gets it completely and even more, eats it up completely, and Screenreach and the industry will benefit greatly from David having such a visible role within it. He should be able to directly infuse social and mobile connections into what’s expected from digital signage immediately. All three of these individuals should have an indelible impact on the industry. I find myself energized knowing as much. But this could not have happened if the leaders of the respected companies – Jason Kates, Byron Darlison, and Paul Rawlings – did not recognize the need, potential, and competitive advantage that these individuals could fill/enable. These leaders had the wherewithal and courage to create positions for other leaders. And that’s what changes and defines industries. This entry was posted in Digital Signage, Marketing and tagged Digital Out of Home, Digital Signage, DOOH, Engagement on 05/21/2011 by Mike Cearley. Last Friday, I had the pleasure of speaking to the Dallas/Ft. Worth American Marketing Association with 2 extremely talented and smart individuals in the digital signage industry – Brian Hasenbauer from Indoor Direct and Jennifer Bolt, formerly from Tracey Locke, now from RVue. We spoke to the AMA’s New Media Special Interest Group about the “Evolution of Digital Out-of-Home.” Here is my portion of the presentation. View more presentations from Mike Cearley. I am not a media person (like Jennifer). I don’t make my living working for a DOOH network (like Brian). I work for a communications company and I am an experience person. I’m very much in the connections business and one of the opportunities that I am faced with is how we can connect people with each other and the brands/organizations they support while they are physically outside of their homes. In a way, I have a grassroots approach to Out-of-Home, but that’s primarily due to the realistic application I can affect given my job. I’m fascinated by the space and the experiences brands can now create Out-of-Home so I think I have a pretty broad perspective, based on experience and study. I see this “Out-of-Home” space as a blank canvas to create connections. Our society (and world) is based on human connections. Technology (especially mobile) has enabled broader and more efficient connections. It’s no longer the barrier. In fact, it’s a powerful enabler. So, the opportunity for brands to connect with people while they’re outside of their homes, on the go, is greater today than it ever has been. At the heart of connections is communication and effective communication is 2-way. This is important. Because it requires listening and engaging. Both ways. Out-of-Home has typically been a great Awareness channel. Effective at getting as many eyeballs on an ad as possible. The introduction of “digital” to the Out-of-Home mix, insofar as making the display digital, does nothing to channel other than to make it more efficient. Moving images and bling make it into “Digital Out-of-Home,” but it does not fundamentally change the channel. What does fundamentally change the channel is a different kind of technology – “enabling” technology. Technology that enables connection with the brand or with other people. Technology like touch or gesture or Bluetooth or geo-location or image recognition. There are a fair amount of technologies that enable something digital or non-digital (bling or not) to drive connections. This kind of technology changes the channel from an effective Awareness channel to an Engagement channel, and this is the true potential, and the future, of Out-of-Home. In my opinion. Then, some examples – the first Walgreens example represents the difference between non-digital Out-of-Home and Digital Out-of-Home. Adding a display technology onto the sign does nothing other than provide more space to advertise. But, as soon as you introduce a short-code to drive connections on that digital sign, it instantly becomes another way into the brand, a way to connect with them. Then, you can see other examples of the “Awareness” execution of the space compared to the “Engagement” execution of the space. And the space, again in my opinion, is no longer just billboards, posters, or kiosks. 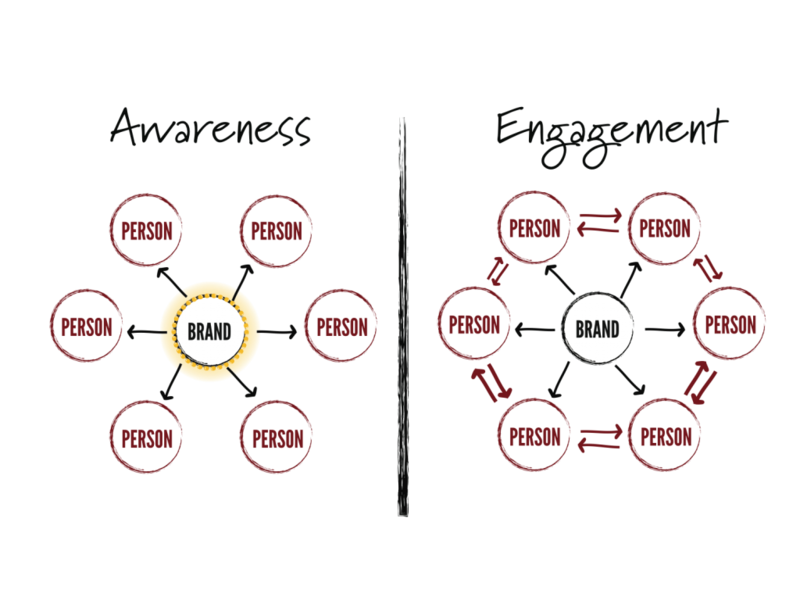 It’s the places and things around us in the real world – like products and packages – that are becoming channels into the brand experience themselves. This is the future. And to me, I’m afraid it can’t be defined as “Digital Out-of-Home.” That is much, much too limiting. If you have any questions on the presentation, feel free to drop me a line. I’m more than happy to discuss in more detail. As always, thanks for reading! This entry was posted in Digital Signage, Emerging Technology, Marketing and tagged Awareness OOH, Digital Out of Home, Digital Signage, DOOH, enabling technology, Engagement, Engagement OOH, OOH, Out of Home on 05/17/2011 by Mike Cearley. What Exactly are Table Stakes Today? Is digital always better? Especially in terms of signage? From my perspective – one that is pretty dialed into the digital signage/digital Out of Home (DOOH) industry – I often feel like there is a misguided notion that digital is always better. Yes, digital can deliver more messages and adjust based on time of day, demographic, and/or location, but more and even more targeted messages don’t necessarily translate into better. To me, it’s all about how good that message is and whether or not it enables an opportunity for the consumer to be driven deeper into the brand. While both of these solutions – and any digital solution, for that matter – can create efficiencies, cut a whole slew of costs and ultimately help to drive more sales (by serving up images of drinks or desserts, for instance), I just wonder if they’re addressing the real need? Which, to me, is to drive loyalty, deepen the brand experience, and get patrons to come in again. From this perspective, digital has nothing to do with it. And message and connection have everything to do with it. Last night, I saw this boring, laminated table top sign at Houlihans. While I understand that these examples seemingly have a different purpose on the table, I’ll go back to the real need. Is it to drive sales or deeper connection? The answer is both. I know. But when you think about table stakes in today’s always-on, digitally-driven world, in casual dining restaurants like this – what’s most important to have? Something digital? Or something that enables connections? Mobile – The next thing on the sign. Text a short code in to receive specials. 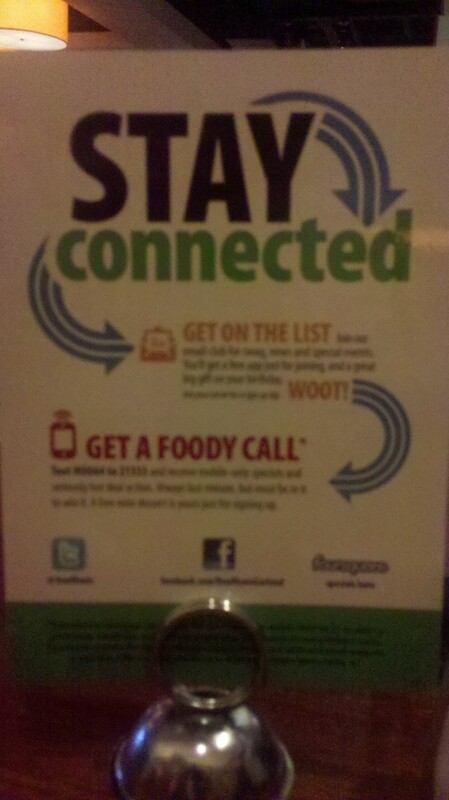 And just by signing up, get a free mini dessert. Social – Twitter & Facebook identities right out in front to connect with the brand in their social channels. Geo-location – Fourquare specials here. And it’s one of the only restaurants like this that I’ve eaten at that provide specials for checking in (it’s good, too). I have no idea what restaurants choose to show on digital screens at the table, if in fact they have them. The ones that I’ve witnessed myself, and then seen through their own advertisements, miss this connection point completely. There is value in having such an efficient display system, for sure. 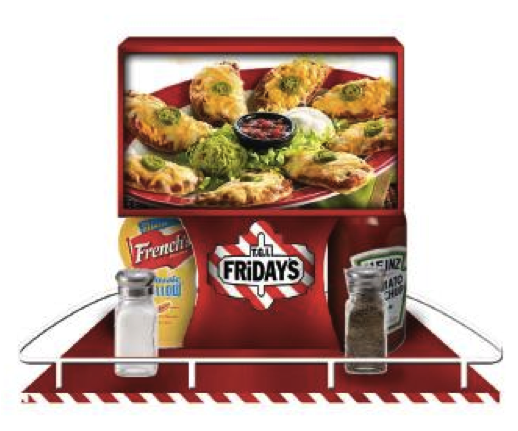 But if the message is all about food, food, food (or, really, sell, sell, sell), I believe patrons aren’t going to feel one way or another about your brand, especially as it relates to your fancy digital table top solution. They might buy more food when they’re sitting there that one time. And maybe even next time, if they come in. But in the end, that’s all they’re doing. They’re not connecting to the brand, which can impact the way they feel about the brand, and ultimately drive loyalty. There is a simple notion that cannot be misguided – people, in some way, want to be connected. So, shouldn’t table stakes in today’s casual dining restaurant world be all about those connections and not the technology? 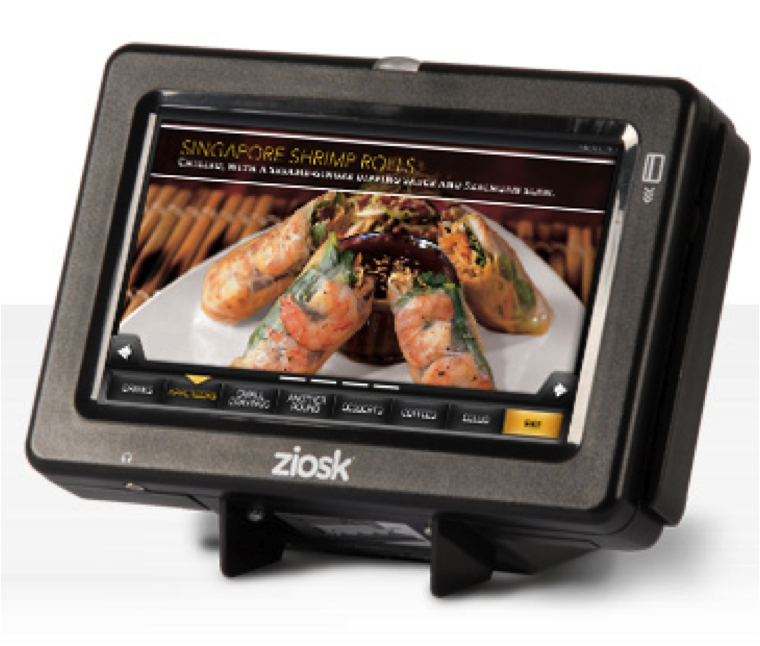 This entry was posted in Digital Signage, Emerging Technology, Marketing and tagged CommCaddy, Digital Signage, DOOH, Houlihans, table top displays, Ziosk on 05/07/2011 by Mike Cearley.